Mastigoproctus giganteus, the giant whip scorpion, also called the giant vinegaroon or grampus, is a species of whip scorpions in the family Thelyphonidae. This species can grow to be 40–60 millimetres (1.6–2.4 in) long, excluding the tail. 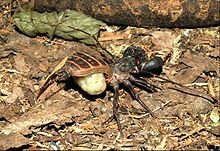 They have six legs used for movement, two long antenniform front legs that they use to feel around for prey and detect vibrations, and two large pedipalps modified into claws that they use to crush their prey. They have a long, thin, whip-like tail, the origin of the common name whipscorpion. From the base of this tail they can spray a substance composed of 85% acetic acid in order to defend themselves. Acetic acid is the main component of vinegar, so the spray smells strongly of vinegar, leading to the common name "vinegarroon". It lives in the southern US and in Mexico. Mastigoproctus giganteus preys on various insects, worms, and slugs. ^ "Mastigoproctus giganteus". Integrated Taxonomic Information System. ^ a b c d Kern Jr., W.H. ; Mitchell, R.E. "Giant Whip Scorpion - Mastigoproctus giganteus giganteus (Lucas, 1835)". Featured Creatures. UF IFAS. Retrieved 23 May 2016. ^ a b c d e f Miner, Angela. "Mastigoproctus giganteus". Animal Diversity Web. University of Michigan Museum of Zoology. Retrieved 23 May 2016. ^ "Species Mastigoproctus giganteus - Giant Vinegaroon". BugGuide.Net. Retrieved 2010-07-30. This page was last edited on 6 December 2018, at 05:48 (UTC).